Camping Le Pesquier is set 500 metres from the centre of Castellane and 1 km from the Verdon River. It offers an outdoor swimming pool, free Wi-Fi in public areas and accommodation with a private terrace. 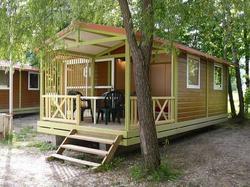 The accommodation at Camping Le Pesquier includes mobile homes and chalets, each with a small seating area. There is also a kitchenette with hotplates and a microwave. Breakfast is available every morning and there is also an on-site bar, where you can relax with a drink on the terrace. A pizzeria is open for lunch and dinner and the local supermarket is 100 metres away. Free private parking is provided on site and Castillon Lake is 5 km away. Other local activities include visiting the regional market, the Citroën Museum or the Musée de la Résistance, all 500 metres away. Please note that an end-of-stay cleaning fee is not included in the price. You can choose to pay the fee or clean the accommodation yourself. Please note that your credit card details for a EUR 200 deposit will be requested upon arrival. These details may be used to charge for any damages incurred to the accommodation during your stay. Daily housekeeping is not included in the price. Please note that bed linen and towels are not provided. Bed linen rental is available at the property. All accommodation features a private terrace with views of the surrounding gardens. There is also a kitchenette, which is fully equipped with hotplates and a microwave.